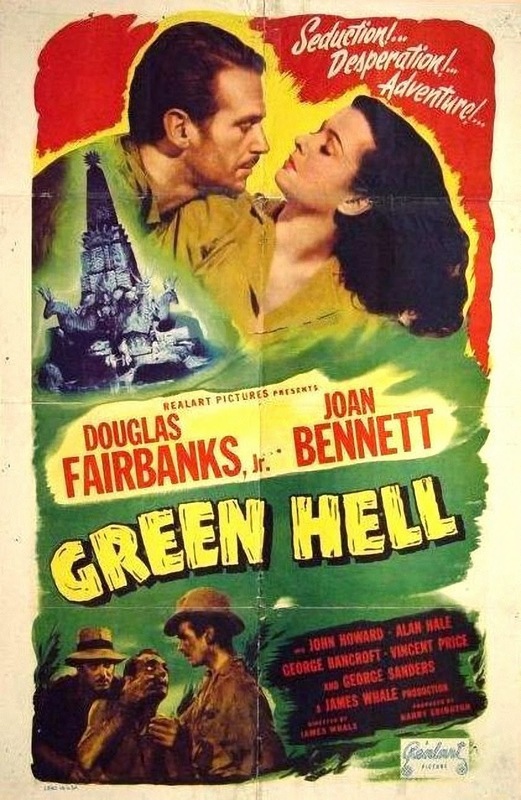 Rupert Pupkin Speaks: Underrated Action/Adventure - Laura G ""
GREEN HELL (James Whale, 1940) - GREEN HELL is a terrific adventure film with a fantastic cast in a fast-paced and entertaining story. Joan Bennett journeys through the jungle to join her husband, who is searching for Incan treasure; she arrives at camp sick with fever, and once she is lucid she's told her husband has died. She won't be lonely long, however, with Douglas Fairbanks Jr. and George Sanders both in love with her. How lucky can a girl get? Director Whale and the cast make a fairly standard jungle story thoroughly enjoyable, though I suspect if one looks closely it's filled with plot holes. No matter, though, when a movie is this much fun! There's also quite a harrowing, memorable ending as warring natives close in and the explorers run low on ammunition. The fine supporting cast includes Vincent Price, Alan Hale Sr., and George Bancroft. Filmed in black and white by Karl Freund. Sadly, this James Whale Production, originally distributed by Universal Pictures, is not available on DVD. ISLAND IN THE SKY (William Wellman, 1953) - ISLAND IN THE SKY might just get my vote for the greatest ensemble cast of all time. A Corsair plane piloted by John Wayne and Sean McClory goes down in the uncharted wilderness of Labrador. The pilots and crew (Jimmy Lydon, Wally Cassell, Hal Baylor) survive, but staying alive in a sub-zero environment won't be easy, with minimal food and limited radio power to contact rescuers. Wayne's pilot buddies launch a search which amounts to looking for the proverbial needle in the haystack, but they refuse to give up, often at risk of their own lives. The pilots are played by Andy Devine, Lloyd Nolan, Allyn Joslyn, James Arness, Paul Fix, and Louis Jean Heydt. Their crew members include Fess Parker, Mike "Touch" Connors, Bob Steele, Harry Carey Jr., Carl "Alfalfa" Switzer, Herbert Anderson, and Darryl Hickman, with Regis Toomey and Walter Abel lending supporting on the ground. Despite so many actors competing for screen time in this 109-minute film, they make their characters distinctive and interesting; personally I think Devine, as the ultra-laid-back but super-competent Willie Moon, should have received an Oscar nomination as Best Supporting Actor. Filmed in black and white by Archie Stout, with aerial cinematography by William Clothier, and narrated by director Wellman, this is one not to miss; it's long been in the shadow of Wellman and Wayne's THE HIGH AND THE MIGHTY (1954), but personally I think this realistic, gritty survival tale is the better film. 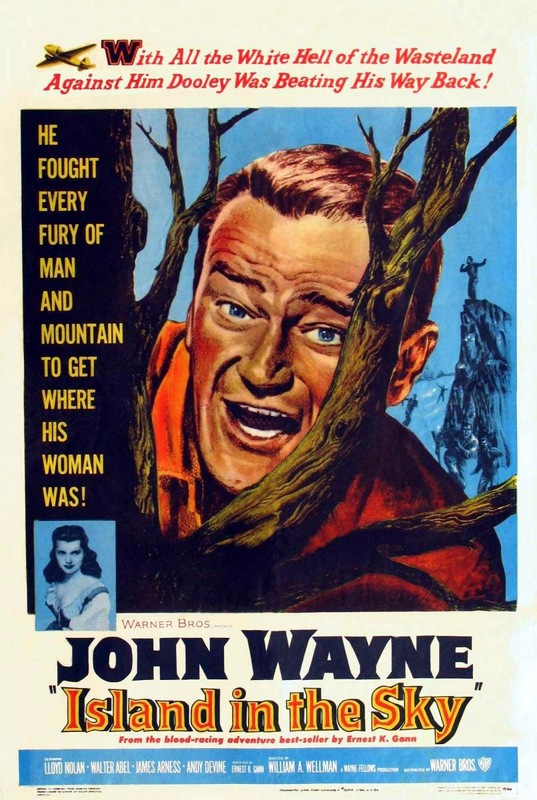 Available on in the fine John Wayne Collection, with excellent extras. 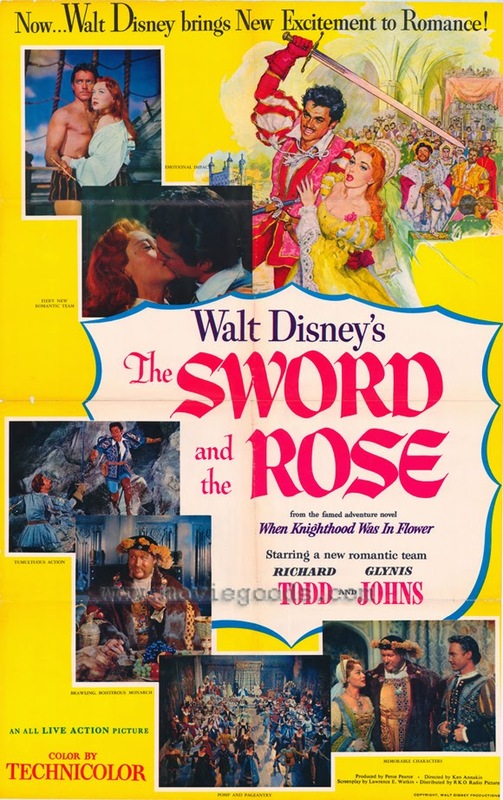 THE SWORD AND THE ROSE (Ken Annakin, 1953) - In the early '50s Walt Disney made a trio of films in the UK starring his friend Richard Todd. 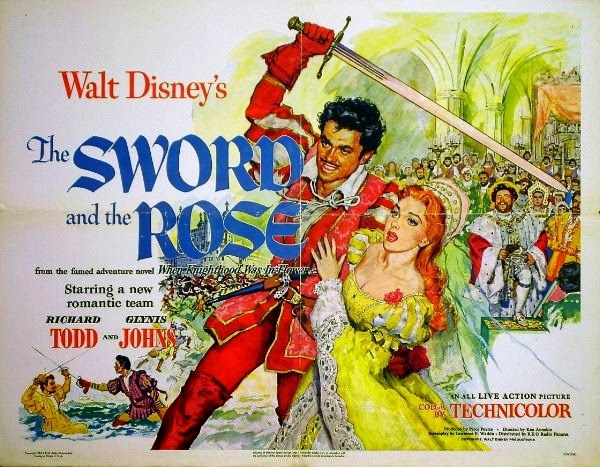 THE SWORD AND THE ROSE was the second film, following THE STORY OF ROBIN HOOD AND HIS MERRIE MEN (1952). THE SWORD AND THE ROSE is a fine swashbuckling romance set at the court of Henry VIII, with Glynis Johns is a delightful performance as Henry's sister, Mary Tudor. (Johns would famously play Mrs. Banks in Disney's MARY POPPINS a little over a decade later.) Mary is ordered by her brother to marry the king of France, but she loves commoner Charles Brandon (Todd), the Captain of the Guards. Mary, possessed of remarkable diplomatic skills, negotiates an eventual happy ending; there's also an exciting rescue and a sword battle. James Robertson Justice lends fine support as Henry VIII. The Technicolor cinematography was by Geoffrey Unsworth, with lovely matte paintings by Peter Ellenshaw. Available in limited quantities in the Disney Movie Rewards series. It's also available for streaming via Amazon. 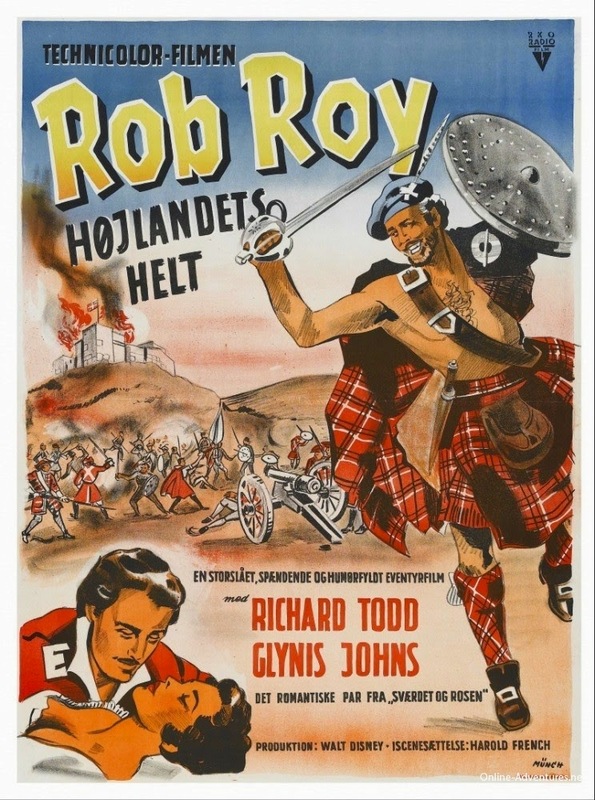 ROB ROY: THE HIGHLAND ROGUE (Harold French, 1953) - Todd and Johns returned as the leads of ROB ROY: THE HIGHLAND ROGUE. While Johns steals THE SWORD AND THE ROSE, ROB ROY is Todd's chance to shine as the dashing Scotsman who leads his clan in rebellion against George I. He excels as the handsome, charismatic leader, with Johns as his feisty wife, Helen Mary. James Robertson Justice, who like Todd appeared in all three of these Disney films, here plays the Duke of Argyll. Filmed in Technicolor by Guy Green. These British Disney films are quite unlike anything else the studio ever made, and I highly recommend seeking out these colorful, relatively little-known adventures. In a just world Disney would release all three of these films in a collection! Like THE SWORD AND THE ROSE, ROB ROY is out only from the Disney Movie Rewards series, which means paying a dealer a premium price. It's also available for streaming on Amazon. Available on Region 2 DVD or via Amazon Prime streaming. Way to go, Laura. I always love to see Island In The Sky get some attention. Probably the most underappreciated film Wayne made. and some that I must catch up with again. always been a personal fave of mine,such an amazing cast. Nice choices here, Laura. It's nice to see this particular Wayne included as it is indeed "under-rated". I remember being taken, age probably 7, to see "ROB ROY" on its release at the cinema. Loved it. As for "HELL DRIVERS" - why didn't I think of that one? An absolute favourite of mine. An absolutely great choice, Laura! I love all five of these and they are all underrated too. The Ken Annakin/Richard Todd/Disney movies remain a happy memory of my childhood--I saw all three multiple times. Don't know why ROBIN HOOD AND HIS MERRIE MEN is least of the three except that it has to compete with other great versions and for me I guess Glynis Johns was a more captivating heroine than Joan Rice. I know THE SOWRD AND THE ROSE was my favorite. GREEN HELL is just wonderful--the one time I saw it I simply adored it. That kind of movie so represents why one loves movies and it was done with such flair. I couldn't even believe how good it was because I'd never heard anyone say anything about it yet it was directed by James Whale. I liked it as well as any of his more famous movies as it has that great cast too, as you say. When I caught up with HELL DRIVERS a few years back, it was another one I'd never heard of--though had liked other movies by Cy Endfield. What a terrific, tough movie it turned out to be--and yes, it picks up fans when it's seen but I believe it's still not at all widely known, so remains a perfect choice for underrated. (And since we're speaking of action/adventure, Laura, sometime sooner rather than later, you'll really want to see Endfield's NOT underrated ZULU--deservedly thought of as a masterpiece by its many fans--which also stars the terrific Stanley Baker). That leaves ISLAND OF THE SKY, which I observe gets a lot of love not only from you but the others here. I share that and if I had to name one of these as the best of the five that would probably be it. What a wonderful, compelling story of survival and communal loyalty among the fliers, and it so beautifully sustains its mood visually too. Your observation about the great ensemble got me thinking that action/adventure with all male casts may somehow lend itself to this because some others that I think compare well came quickly to mind, especially THE GREAT ESCAPE, another NOT underrated action/adventure (it has always been tremendously popular). I recently mentioned this movie when we were discussing James Garner, who is great in it, but it is stunning ensemble of actors who are all ideally cast and equally memorable, and that was one of its many pleasures. Thanks for a list that was a joy to read. I remember seeing THE STORY OF ROBIN HOOD AND HIS MERRIE MEN in a theater as part of a birthday party as a child -- one of Disney's periodic reissues. Curiously, ROBIN HOOD is the only one Disney has released on a regular DVD easily available to the general public. Hope to watch it soon. I do feel some regret that this one doesn't also have Glynis Johns, who was such a great asset to the other two films in the trilogy. I'm considering taking my sons to HELL DRIVERS at UCLA next week -- I think they'd both really like it if we can work it out schedulewise. Just rewatched ISLAND IN THE SKY last month! It's been a few years and I feel like watching GREEN HELL again. Fairbanks, Sanders, and Bennett...movie bliss. Thanks so much to you and everyone else who took time to comment above, I love chatting about these movies! Sorry I carelessly overlooked that Harold French, not Ken Annakin, did ROB ROY. The time you spent was well worth it, Laura. I am pleased to share your enthusiasm for Stanley Baker, Blake. A fine actor, mainly in fairly hard-bitten or tough roles but he brought much power to the screen, didn't he? Apart from "HELL DRIVERS" (and, of course, ZULU)two other films of his I like rather a lot are "CHECKPOINT" and "THE GOOD DIE YOUNG". are you familiar with these I wonder? 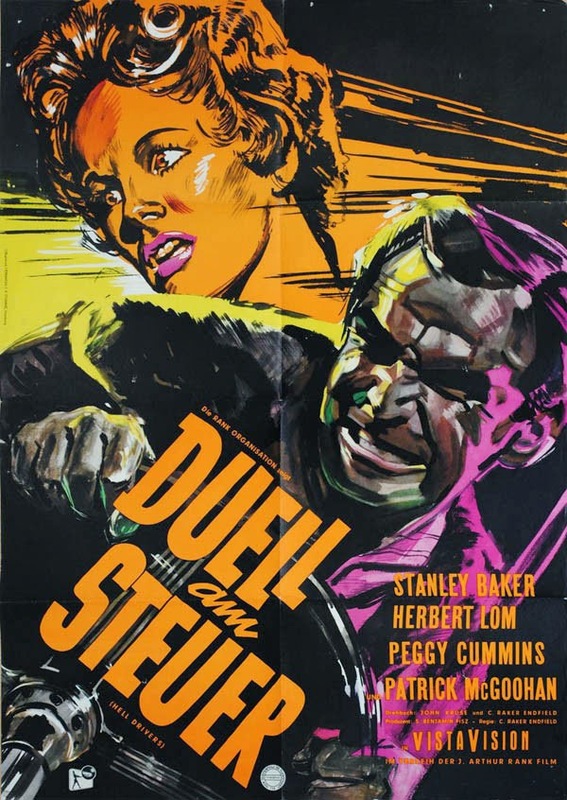 HELL DRIVERS was my introduction to Stanley Baker, so I'm glad to have additional Baker recommendations from both of you, Blake and Jerry! I remember Blake mentioning how much he liked ZULU when it was shown at the TCM Fest, but it didn't work out with my schedule. Blake, I seem to recall reading that Ken Annakin wanted to also direct ROB ROY but he had a contractual conflict which led to Harold French directing the final of the three Disney/Todd films. Jerry, I've seen THE GOOD DIE YOUNG but not CHECKPOINT. I have seen Stanley Baker in a pretty fair number of films and always liked his combination of masculine toughness and knowing intelligence. Laura, I would say HELL DRIVERS is pretty typical of how you might expect him to be though of course his characters vary a lot. I must say I cannot recommend Losey's EVA in which Baker stars with Jeanne Moreau--it's sadomasochistic in such an extreme way that it makes me pull away from it. But Baker's other three Losey films are much easier to like--CHANCE MEETING (aka BLIND DATE), THE CRIMINAL (aka THE CONCRETE JUNGLE) and ACCIDENT. Baker's character in ZULU is heroic--he was great for that. It also launched Michael Caine by the way, the other biggest role and he's great too.